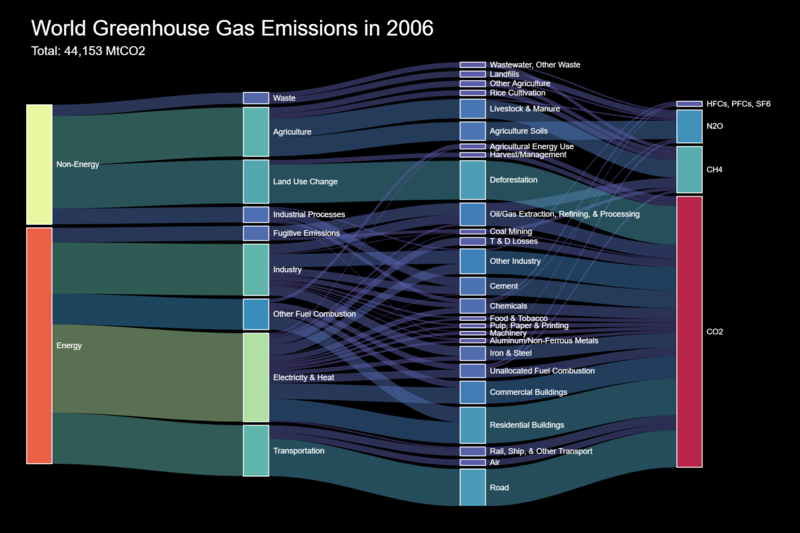 A Sankey chart displaying the percentage of greenhouse gas emissions from different sectors and end-user areas. The flow begins from the left, where we characterize the sources as either “Energy” or “Non-energy”. The second column indicates the industrial sector, the third column indicates end-user areas, and the last column indicates the final emissions in the form of different types of greenhouse gas. For facilitate comparison, the emission values are all converted to CO2 equivalents. Based on a chart produced by the World Resources Institute. Data extracted from the original chart from the World Resources Institute. See the working paper for more information.